A postman needed reconstructive surgery on his hand after he was attacked by a Bull Mastiff dog while making his rounds in Newbridge in south Wales. The man had to spend three days in hospital after being attacked by the animal as he delivered mail to a house. A week later, a Royal Mail manager was bitten by another dog in the same area of the town. It has prompted a Wales-wide campaign by Royal Mail to encourage dog owners to keep their animals under control. The postman, who does not want to be named, had been on his daily rounds when he came under attack by the dog from a house on his route. 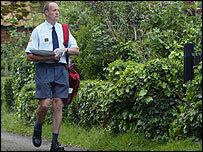 "It all happened so quickly," said the man, who has worked for Royal Mail for 18 years. "It just came at me - I put my hand up to protect myself and it sank its teeth into me. There was a lot of blood." The injuries caused by the dog resulted in the postman needing a month off work to recover. Dean Birt, from the Communications Workers Union said: "This was very serious and we really need to get the message across to people that they must keep their animals secure. "He has got permanent scarring and nerve damage in his hand and had to spend three days in hospital. "Dog attacks are a big problem for delivery staff especially in the summer months. People must be more aware of keeping their pets secure." Managers took over responsibility for delivering mail to the street in Newbridge where the attack happened following the incident, but just a week later, one of them was bitten by different dog. Now Royal Mail officials are calling on the public to ensure their animals are under control when their post is being delivered. "A lot of people think it is a bit of a joke to see a postman being bitten by a dog but it is a serious matter," said Mike Leach, a delivery office manager. "We have to ensure the safety of our staff and this latest incident just shows how serious the issue is. "The postman attacked lost a lot of blood and he will have permanent scarring." Although statistics show that the numbers of attacks have decreased in the last year, the summer months are shown to be the time when most occur. "People leave their doors open because it is hot weather and the kids are out playing and so often the dogs can get out easily," said Mr Leach. 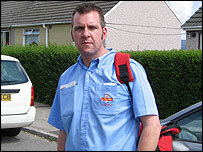 Between 2003 and 2004, 620 postmen were attacked by animals in Wales. There was a total 5,868 dog attacks across the UK for the same period resulting in 5,770 days lost in sick leave. In 2004-2005, there was a total of 4,540 dog attacks in the UK with 199 of those taking place in south Wales. The Crown Prosecution Service is examining the case of the postman attacked in Newbridge to see if a prosecution can be brought against the dog owner.